Associate Professor Olav Muurlink and CQUni PhD student Pratima Durga are pictured in Bangladesh. 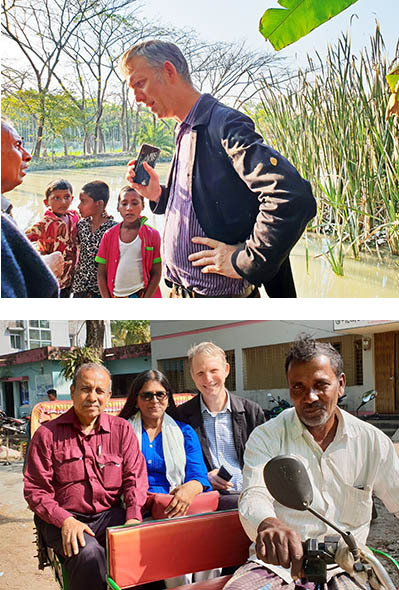 CQUniversity Associate Professor Olav Muurlink and PhD student Pratima Durga have been helping to address some of the more acute drowning risks in the water-logged nation of Bangladesh - a place where children have literally been dying to get to their school. There are 808 rivers in Bangladesh, a country little more than twice the size of Tasmania, emptying nutrient-rich water from India, Nepal and even China into the Bay of Bengal. Bhola Island was the scene of history’s single worst environmental catastrophe when, in 1970, the island was virtually swept clean by a cyclone that took up to 500 000 lives in a single night, with women and children’s lives taken disproportionately by the 15-metre storm surge. The single biggest killer of children 50 years later is still drowning. The death rate in Bangladesh for children 1-4 years old is a horrifying 86.3 per 100 000 per year—which is close to the preventable death rate for Australians of all ages. Associate Professor Muurlink is head of the board of management of the charity Co-operation in Development (Co-ID) which has built over 60 schools and kindergartens in Bhola in the last 30 years. Each school is an island, built up on ‘high ground’ made by hand from mud dug from canals and a myriad of ponds that dot the landscape. the region at the government-run secondary school entrance exams. However, these children are literally dying to get to school. In the last year alone, three youngsters in the school community have died either at school or getting to school - out of a total enrolment of 11 000.
ponds outside the school doors". Dr Muurlink, whose ‘day job’ is head of course in Sustainable Innovation in CQUni’s School of Business, spends much of his spare time - including this January - in Bhola, meeting with the charity’s 180 staff and visiting each of the schools. With one of the smallest budgets of all NGOs operating in Bangladesh - much of the funds coming from primary and secondary school children in Australia - there’s only so much to go around. This year, the charity will be devoting more funds than ever before to trying to address some of the more acute drowning risks. CQUni PhD student Pratima Durga, who is doing a project based on remote health access in Bangladesh, accompanied Dr Muurlink to the island. On seeing the threat first-hand, Ms Durga decided, along with her family, to fund the cost of filling the pond in which the young girl almost drowned. “There is no question of fencing off pools here - there is water everywhere, risk everywhere, even in the dry season,” said Ms Durga, who herself cannot swim. Another danger spot at Choni Char will be addressed by a unique partnership between two unions (or regional councils), separated by a fast-flowing 25-metre-wide stream, and Co-operation in Development. can hold on. The community itself is kicking in around $200 towards the cost to build a sense of ownership.